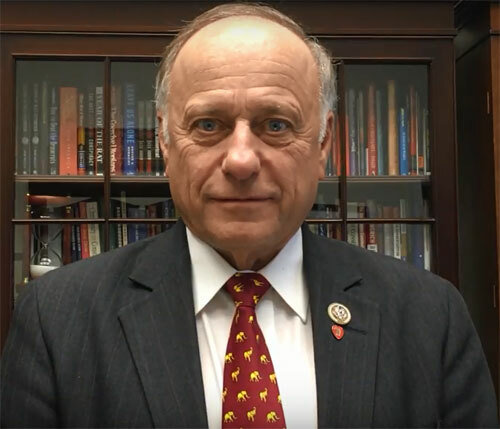 Republican Congressman Steve King’s supporters and opponents gathered in Sioux Center last night as the “Sioux County Conservatives” hosted King at a public event. Steve Mahr helped organize a protest outside the venue, before the meeting began. King later responded to the assertion he doesn’t represent the views of Iowans in the fourth congressional district. During last night’s forum, King was asked to explain a comment posted on his campaign’s Facebook page that criticized one of the students who survived the Florida school shooting. It accused Emma Gonzalez of betraying her Cuban heritage by speaking in favor of gun restrictions during her speech at last week’s march in Washington. That Facebook post motivated Mahr and others to protest King last night. King told reporters his campaign is using Facebook to provide “a rebuttal” to what he says are the “irrational arguments” about guns being made by Gonzalez and other high school students. King’s supporters and opponents attended last night’s meeting in the Sioux Center library.